St Panteleimon was born about 284 AD in the city of Nicodemia. His father, Evstorgios, was an idolater while his mother, Evoulis, was a devout Christian. She raised her son, whose real name was Pantoleonta, in the Christian way of life. She passed away while her son was still young. Initially Pantoleonta was educated in his native tongue and then in Greek. His father sent him to study under the famous physician, Evfrosinos. Quickly he surpassed the other students. He was handsome, soft spoken, humble and all who spoke with him felt true happiness and peace. Because of these virtues, he became well known in Nicodemia. One day he went with Evfrosinos to the palace and it was here that the ruler, Maximian, first saw him. He instructed Evfrosinos to educate Pantoleonta to the utmost so that he could be appointed royal physician. Soon, Pantoleonta was working towards his father's conversion to Christianity. This was finally achieved when he saw his son cure a man of his blindness. By the grace of God, the man regained his sight, not only physically, but also spiritually, for before this time he was an idolater. Pantoleonta took the man and his father to St Ermolaos who baptised them. Pantoleonta distributed his wealth among the poor and then proceeded to cure all who came to him. The only payment the St would ask was that the healed person believe that Jesus Christ was their true healer. 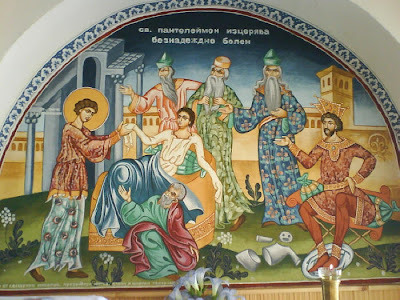 The other physicians became very envious and wanting to betray the Saint to the Emperor, a group of them went to Maximian and told him that the doctor that he himself had educated was healing Christians and that the idolaters were converting to Christianity. As proof, the blind man who was cured was brought before the Emperor, who tried to convince him that the gods had cured him and not Christ. But it was futile. Maximian realised that everything the doctors had told him was true. He ordered that the man be beheaded. 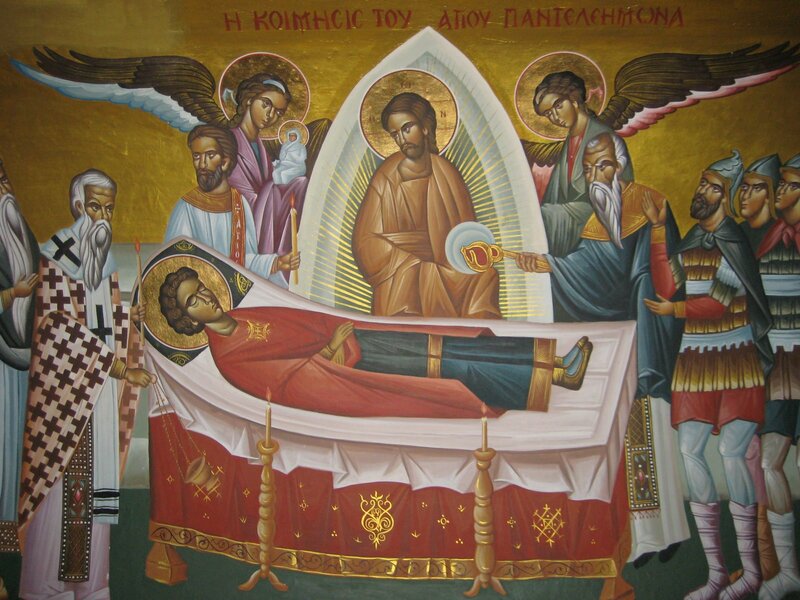 The Saint secretly took the man's body and buried it in a Christian place. The Saint was submitted to even more tortures. He was tied to a wheel and then rolled down a hill. The purpose was to tear the Saint's Body to pieces. Instead, it rolled over several idolaters and killed them. The Saint again suffered no harm. 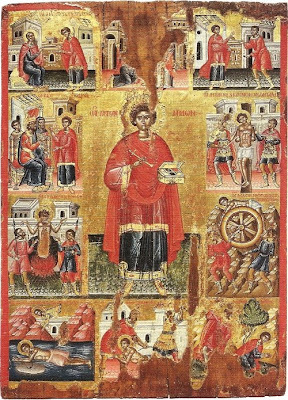 St John of Damascus informs us that the remains were transported to Constantinople, however, in the 12th century they were removed by the Crusaders. 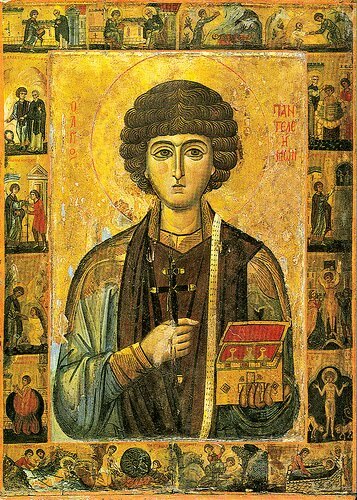 St Panteleimon is often asked by faithful Christians to aid them in times of sickness. He is believed to take special interest in those who are crippled. He is considered equal to the Benevolent Saints Kosmas and Damianos. 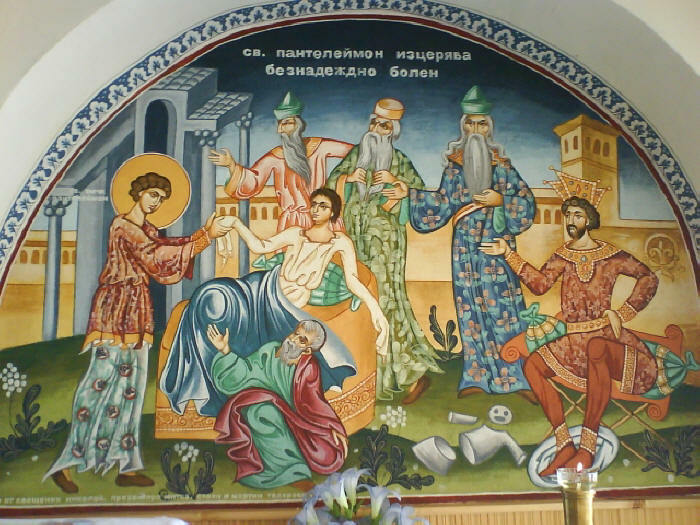 Holy champion and healer Panteleimon, intercede with our merciful God to grant our souls remission of sins.